Vietnam Fine Arts Museum, #66 Nguyen Thai Hoc street. Ly Hung Anh, Dang Xuan Truong and Luong Duc Hung – An artist, a photographer and a sculptor – will together display their latest artworks in the exhibition “3 Cognitive”, from 31 August to 4 September at Vietnam Fine Art Museum. Cognitive vibration has been changed its form in process of searching itself every moment. Life is going on as if pulling about, as if to abandon one’s body in order to go back to its original essence. 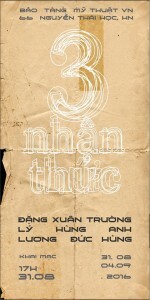 You are cordially invited to the Exhibition “3 Cognitive” at 5p.m on Wednesday 31 August, at Vietnam Fine Art Museum.